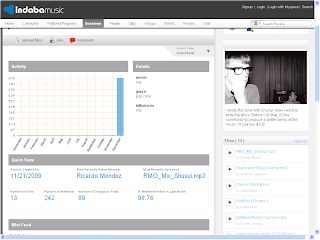 Indaba Music is a music site and community that allows musicians to meet and collaborate with others online. Founded in 2005, it claims to have 350,00 members all around the world, and is now featuring remix competitions for established artists like our old friend T-Pain, and Rivers Cuomo of Weezer. "I wrote this tune with Shusui. Now I want to write the lyrics. Before I do that, I'd like somebody to produce a better demo of the music. I'll pay you $208."